I try to tread lightly when referring to a game as being a “clone” of another game. 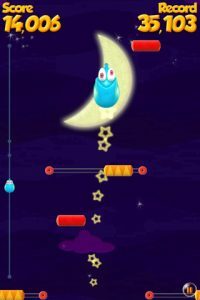 However, I suspect Chillingo was banking on using the success of the immensely popular Doodle Jump to drive sales to their new game, Let’s Jump. With respect, Let’s Jump is a fairly blatant clone of Doodle Jump; at least in the single-player mode. You see, the as the title implies, Let’s Jump encourages you to get your friends involved, bouncing skyward to the finish line. 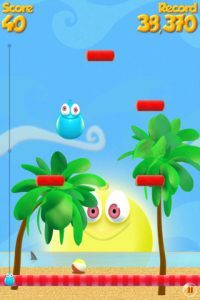 Tacking on a multiplayer mode doesn’t make Let’s Jump revolutionary or even do much to distinguish itself from Doodle Jump, but it is a nice addition and a good option for Doodle champs to put their skills to the test. 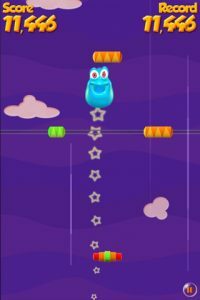 In Let’s Jump, it’s your mission to guide a bouncy little character eternally upward by tilting the iPhone and landing him on platforms. Some of the platforms disappear after one bounce, some rocket your character higher, and so on. The higher you bounce, the higher you score. Drop too far, and it’s game over. Scores are shared on GameCenter, along with the standard Twitter and Facebook options. The Solo mode is competent and well-executed, but it’s the Race mode that makes Let’s Jump worth a second look. Race mode is exactly what it sounds like: race an opponent to the top, only you don’t have to worry about falling too far as rather than ending your game, you simply have to catch back up to your opponent. Race can be played via Pass & Play, Bluetooth, or Online. In my testing, I was able to find an online opponent immediately and the connection was quick and lag-free. The most appealing aspect of Race mode, and what sets it apart from the passive competitiveness of leaderboard chasing, is seeing your opponent’s position at the side of the screen and trying to hit the special platforms to rocket yourself higher more quickly. Let’s Jump has a charming primary color, cartoon-like visual style. The platforms are easy to see and navigate and the tilt controls are forgiving, never leaving you with the feeling you’ve been cheated. Bottom Line: Let’s Jump won’t win an originality awards, but the Race mode is well worth your time. 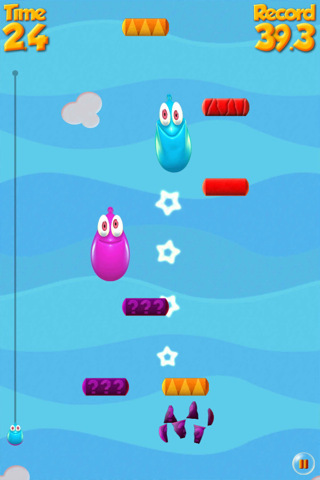 Let’s Jump is compatible with iPhone, iPod touch, and iPad. Requires iOS 3.1.2 or later.